My belts were in very poor condition, so I decided to replace them. 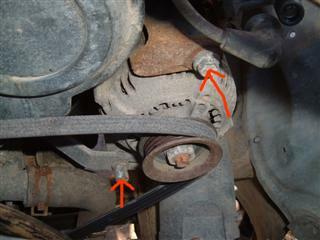 Shockingly, I found out that the previous owner had put the A/C belt on inside out, with the V-groove facing outwards, instead of inwards riding on the pulley. What a moron! But it has worked OK since I bought it over 2 years ago. The other 2 belts were cracked and frayed.